Turn your windowsill into a fresh produce counter with this self-watering pepper grow kit. 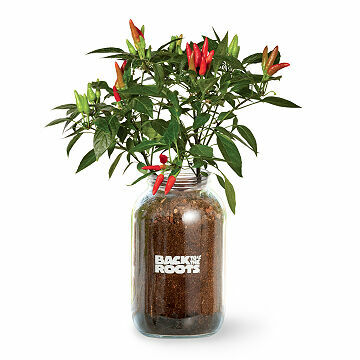 Turn your windowsill into a fresh produce counter with this chili pepper grow kit that includes everything you need to enjoy the fiery fruits of your minimal labor. The secret to fool-proof cultivation is the olla ("oy-yah"), a four thousand-year-old piece of agricultural technology. It's a small, unglazed ceramic jar that automatically releases the right amount of moisture into the soil when you fill it with water once a week. The kit also includes all the supplies you need—fast-germinating seeds, growing jar, organic soil, and organic fertilizer spikes—to cultivate your own peppers, green thumbs or not. All you need is a little patience and a taste for fresh peppers in your chili, tacos, or salsa picante. Seeds typically germinate in 1-2 weeks. Made in Utah. UG's resident Data Scientist, Dr. Ken, put this self-sufficient planter to the test. But did his wee houseplant bear fruit after all? Find out on the blog. It started with a random fact heard in a college class: mushrooms could be grown on spent coffee grounds. Alejandro Velez and Nikhil Arora's mutual curiosity about urban farming brought them together and after successfully growing their own crop, Back to the Roots was born. The team gave up their corporate job offers and started growing mushrooms in Oakland, California full time. Founded in 2009 and certified as a B Corp in 2012, Back to the Roots started with sustainable DIY mushroom kits, but their mission to to “make food personal again” has since led them to create a variety of grow-at-home products. By using an urban waste stream to produce local, fresh food, they’re working to inspire people to think about where their food comes from and how they can better use the resources (like coffee grounds) that are already at their disposal. Refill olla when empty and soil appears dry (approximately once a week). Push one organic fertilizer spike into soil when flowers appear and the second spike after first peppers appear. Has done exactly what it said it would do so far. Can't wait to see the results. My mom absolutely loves this! I bought her the tomato plant at Christmas, which I could tell she loved right away. So, when she was having a rough week and I wanted to send her a little pick me up, I knew this would be perfect! I'm so excited for this to grow!! Very easy to start! Looking forward to watching this bloom!